Waterworld Bundoran, Ireland’s Premier Indoor Aqua Adventure Playground, has once again been awarded the only White Flag for County Donegal. The Ireland Active ‘Gold Award’ was presented to Waterworld General Manager Anderson Keys at a ceremony recently in Salthill, County Galway. 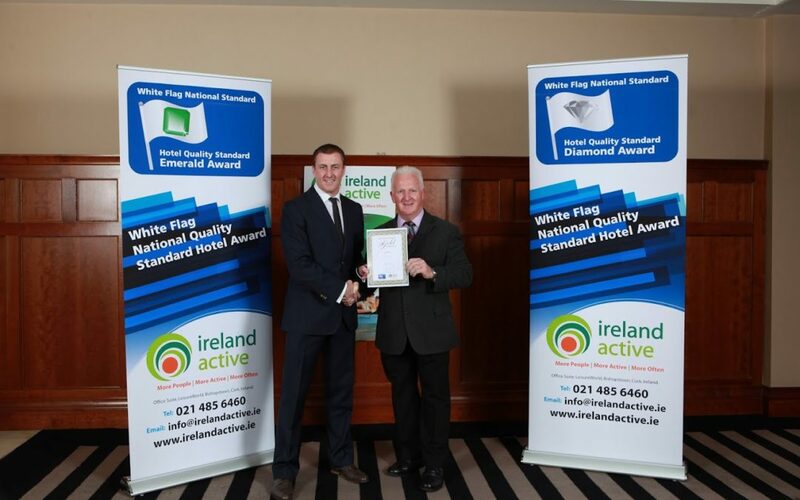 The White Flag National Quality Standard, grades facilities’ operational standards, similar to the Blue Flag award which classifies Ireland’s beaches, and it is fast becoming the most sought after accolade in the leisure industry. It is the only industry specific award for the Irish Leisure and Spa Industry. The White Flag National quality standard is based on the 3 essential areas when operating any leisure centre or spa: Safety, Hygiene & Maintenance and Customer Care. The standard is designed to encourage continuous improvement and it is categorised into three levels for the leisure centre sector: Gold, Silver and Bronze. Christine Moloney, Chairperson of Ireland Active said “The White Flag National standard is a best practice management framework to provide good quality facilities and services to the consumer in asafe and hygienic environment. Every consumer should be aware of the professional standards required and quality mark in the leisure facilities they attend”. Chief Executive of Donegal County Council Seamus Neely and Operators of Waterworld, said “we are delighted that Waterworld has once again attained the White Flag National Quality Standard. Achieving this best practice standard is a great reflection on the hard working team at Waterworld Bundoran. I would like to congratulate Anderson Keys and his team on achieving this accolade. Waterworld Bundoran is a top class leisure facility targeting the family market and is without doubt a key driver in growing the tourism sector in Bundoran and South Donegal”.